We are proud of our range of boards, this is because we believe we stock the best selection of chess boards in Europe, possibly the world. We import an amazing selection of veneer and solid wooden chess boards from the worlds best known producers of chess boards. 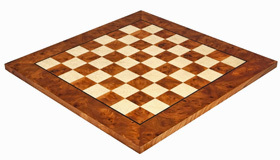 Our range of chess boards come from Italy, Poland and Spain. The Italians are well known for their manufacturing of very high quality luxury goods and their chess boards are no exception. Our Italian suppliers are responsible for some of the highest quality chess boards in our range. Their hand inlaid, gloss lacquered boards are simply stunning. We also stock a vast range of Spanish products from the well known producer Rapachados Ferrer. This well established company provides us with a staple diet of excellent quality boards. Not only do we stock most of their standard range. We also have them make us exclusive custom designed boards that are not available from other retailers online. 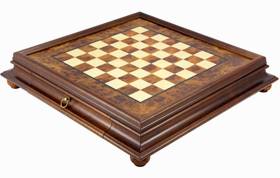 We also stock a comprehensive range of Polish chess boards including a range of expertly made solid wooden boards. Our range of Polish boards are extremely high quality, durable and reliable while remaining competitively priced.